Out-of-state homebuyers are heading South, according to a study released by LendingTree. The study, which looked at where residents in each state are looking to move, found a Southern tilt in preferences among out-of-state homebuyers. LendingTree reviewed purchase mortgage loan requests for primary residences in all 50 states from October 2016 through October to find the percentage of all requests from residents looking to move outside of their current state. 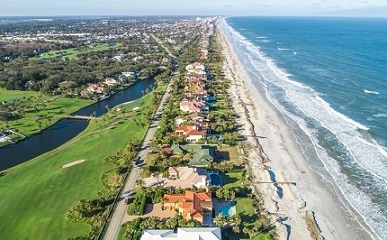 Florida was found to be the number one destination for such homebuyers, with 18 of the 50 states having the state as the number one new destination. The study found that 9.14% of all purchase mortgage requests covered in the study were made by consumers seeking to move to Florida. Meanwhile, Texas recorded the highest percentage of residents who looked to move within the state rather than out of it. The study found that 92.54% of purchase mortgage requests by Texans were for homes within the state. Michigan followed with the second highest percentage of residents seeking to move within the state. In contrast, Vermont saw the lowest percentage of residents looking to stay in the state. LendingTree found that 75.93% of purchase mortgage requests by residents of the state were for Vermont properties. LendingTree also found most homebuyers considering a move outside their home state do not want to go far. The study revealed that more than half of the most popular new destination states border the current state.